Reporting on Files can be used for both reporting and downloading files which have been uploaded by the users. 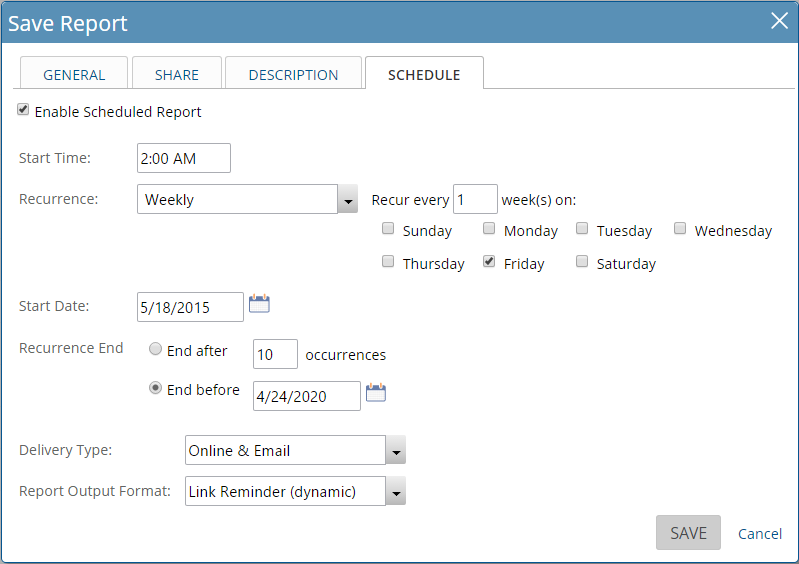 There are two different options available for filtering by dates. They include Created On and Updated On. 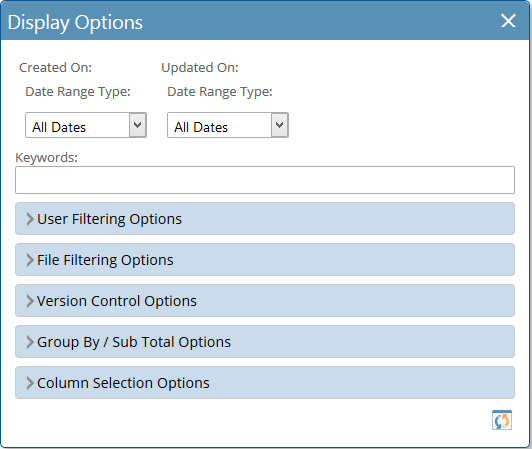 User options can be set to filter based on Created By or Updated By. Each is a list of Project Insight users. File Type can be set to filter based on the type of file (doc, xls, etc.). Parent Item can be selected to filter on a certain folder including or excluding children on that folder. Size can be used to further filter based upon a minimum and/or maximum file size. Checked Out a date range can be selected to filter when the file was checked out. User Checked Out a user can be selected from the drop down list to filter only files checked out by this user. The following options are available to further filter the result. Once you run the report the ability to select files to download is now always visible and there is no longer any need to select the option in the filtering options. To select files to download simply check the check-boxes for the desired files, or you can right click on the selection column to "Check All" and that will select all files present in the file report. In addition to download any selected files you may right-click at any time the selection column or you can left-click the header of the selection column. Once that is done you will get a message stating "A link will be emailed to you shortly from which you can download your files." 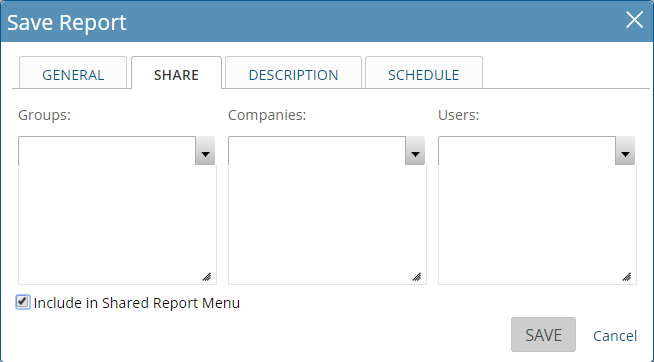 After selecting your display options for the report click on the run report button to view your report. You can continue to update and change the display options and re-run the report as needed until you have your desired results. 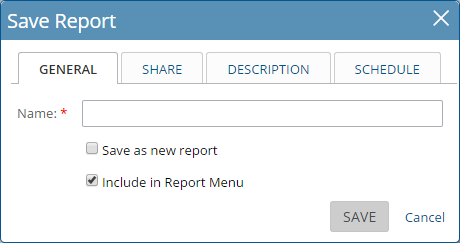 On the General tab for saved reports, you can choose to include the report in the Report Menu. This places the report in the drop-down, fly-out menu of the global report navigation. The report will be available on that menu for you and for anybody who also has the report by way of sharing it with them. There may also be an option to save as new report if the report you're using originated from a previously saved report. Save as new will save a new report without overwriting any changes you've made to the previously saved report. Saving as new does not force a name change to the saved report, but it is always a good idea to change the name anyway so that you do not have two different reports with the same name. If the report you are saving was shared to you by another user as the original report creator, the save as new report option is the only option available. You cannot make and save modifications to a report created by another person, but rather you will save your own new report.